Also some ideas on RF reflectors or absorbers, to reduce exposure if they are already installed. Here, for example, shows how using a simple 3′ square piece of aluminum screen will block the RF signals coming out the front side of the "smart meter". Other links at these YouTube pages give other ideas, showing also recorded examples where meter-installers are confronted and stopped. Don’t lay down and be a passive victim. 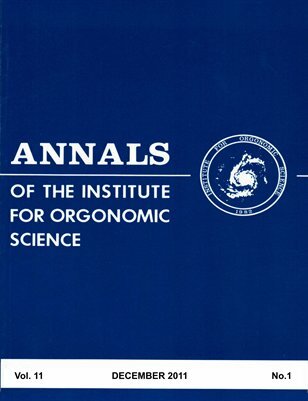 The latest issue of the Annals of the Institute for Orgonomic Science, Volume 11, Number 1, (2011) is now available. In “Malinowski Revisited and Reich’s Children on the Future,” Morton Herskowitz discusses Reich’s insights concerning childhood in the light of Bronislaw Malinowski’s findings in his classic anthropological studies of the Trobriand islanders. In “Double-Blind Controlled Experiments in the Orgone Energy Accumulator,” Philip Bennett reviews the history of double-blind methods in biomedical research, noting the paucityof their use in orgonomic research. He then describes recent double-blind studies demonstrating biological effects of a device that resembles the orgone energy accumulator. In “Onion Plant Responses to Orgone Accumulator Treatment,” J. Heckman presents data from two field experiments on the effects of different durations of accumulator treatment ofonion bulbs before planting. Although no significant differences in plant growth parameters were noted, the results suggest that orgone accumulator treatment may retard leafsenescence. In “Politics, Religion and Human Nature,” Peter Robbins illustrates how irrationalism in politics and society have obstructed scientific research on unidentified flying objects. In “Children as Teachers,” Dorothea Fuckert describes her experiences parenting based on self-regulation. She describes what she and her husband learned from their two sons asthey grew up from infancy through their experiences at Summerhill School and into early adulthood. In “Foundations for a Functional Analysis of Economics,” Dean Davidson describes Reich’s use of Karl Marx’s analysis of living working power and its role in the production ofsurplus value. He contrasts Reich’s approach with more recent attempts to understand human economic relations that have ignored these findings. In “Orgone Therapy – A Patient’s Perspective,” a patient movingly describes the impact of orgone therapy on her life. The “Communications and Notes” section includes memorial tributes to Bernard R. Grad, Ph.D., Eva Renate Reich, M.D. and Ilse Ollendorff Reich; a listing of recent lectures andpublications by members of the Institute; and an announcement of the Training Program in Orgonomic Therapy offered by the Institute. 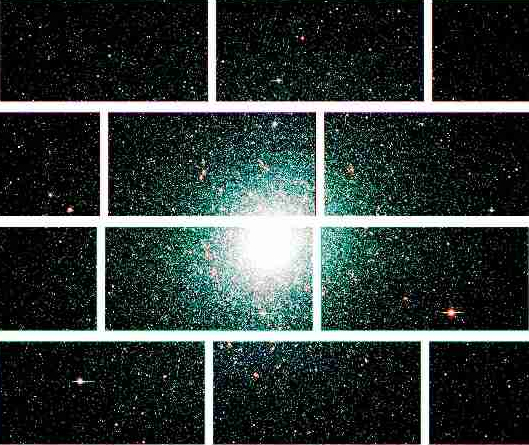 More evidence of blue-glowing orgone energy in the cosmos, as a halo-effect surrounding galaxies and other cosmic objects, as taken from a new "dark matter/energy" camera, the most sensitive CCD camera ever constructed. This is excellent empirical astronomy, but lousy theoretical astrophysics. 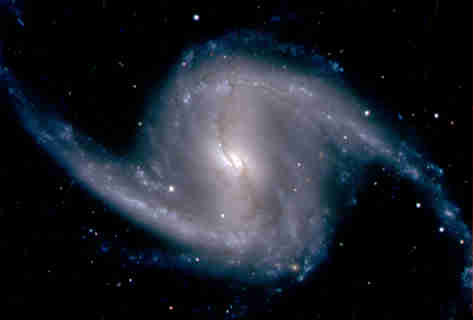 The gravitational effects observed, and the blue-glowing nature of dark matter (or energy, as you will), are very real, but it is all too similar to what Wilhelm Reich called the cosmic orgone energy, an ether-like substrate which has gravitational properties and also glows with a bluish hue. Of course, with consent and silence of the scientists, Reich was slandered in the 1950s press, thrown into prison and had his books burned. Nobody should mention his name again, we are demanded, but with these new deep-space photos showing more and more of the "blue stuff", I am forced to observe the similarities. I have never before ever seen a globular cluster with such a distinct bluish glow, and the image of NGC1365 has never before shown such a distinctly bluish fringe around it. And then contrast those with these images, from "ordinary" cameras. Is the “Big Chill” On? Is the "Big Chill" On? It is 12 (deg. F. or -11 C.) here in the Verde Valley of Arizona, early for this year all ready coldest day last year was 10. After 9-10 days of 19 many homes had frozen pipes in the Sedona area……….we have doubled up on our heaters on the colder walls.. The remarkable thing about these reports is, that they come so early in Winter. If these reports happened in mid-February, they would not appear so unusual. Unfortunately, we only just now enter January, and the worst of winter has yet to show its face. Stay tuned, and keep warm. "In Defense of Wilhelm Reich: An Open Response to Nature and the Scientific /Medical Community", in Water journal 4:72-81, 2012. By 24 scientists and physicians. Here’s the specific pdf download link. This is a peer-reviewed journal of some merit, and so it should be widely circulated by both weblink and independently via the PDF copy which is also available. Nature got their article as written by journalist Josie Glausiusz, who got her bad information about Reich from a public display entitled "Ghosts in the Machine" as presented at the New Museum in New York City. The New Museum curators Massimiliano Gioni and Gary Carrion-Murayari wrote a book on this display, which they created, also titled Ghosts in the Machine. 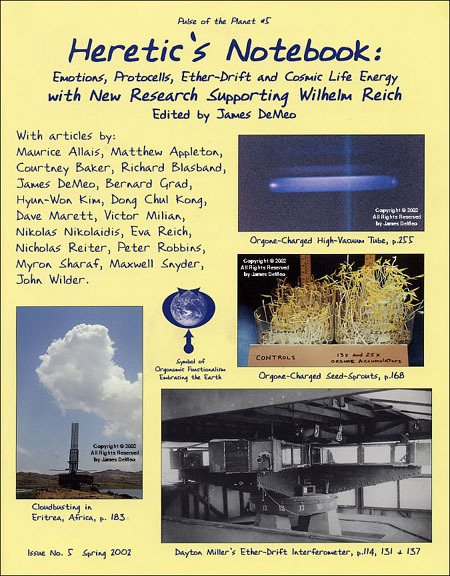 In their book, Wilhelm Reich is mentioned only in a derogatory article reprinted within, as authored by one Christopher Turner, a relatively new face in the phony "skeptic" movement aiming to destroy Reich’s good name and research legacy. Turner had already written a terrible book of ridicule-slander against Reich (Adventures in the Orgasmatron) which appeared in 2011 in both USA and UK editions, along with several additional slander-smear articles in various art-cult and "literary" magazines going back to 2004 or earlier. The Turner "Orgasmatron" book was his most ambitious effort, the publisher refusing to say who, if anyone, was responsible for giving it a fact-check. 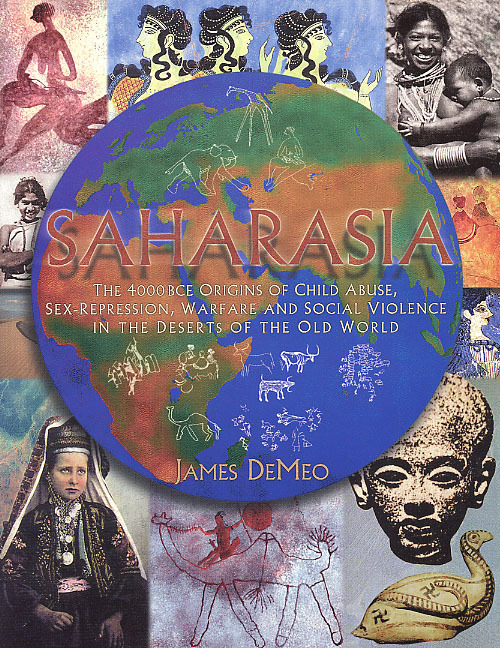 It’s publication was coordinated with a well-planned avalanche of additional slanderous "book reviews" in major newspapers and magazines on both sides of the Atlantic, including one major smear of Reich on UK television. Not accidentally or unexpectedly, the same Turner slanders were repeated on disreputable Wikipedia pages – hopefully everyone reading this already knows about the unreliability of Wikipedia, but their pages on Reich and his research are cases in point. None of the Turner camp-followers bothered to make fact-checks. Rather, they all appear to have made serious "anti-fact checks", making sure none of the published experimental reports verifying Reich’s scientific and medical work, or which presented redeeming facts about his life or work, were allowed to remain standing. Lies of Omission, in abundance! Unsurprisingly, Wikipedia’s anonymous scribblers actually erased such supportive materials which previously had been posted up by scholars sympathetic to Reich. Over the last two years, Reich’s corpse was dug up and subjected to repeated public auto-da-fe, complete with cheering mobs of high-brow “literati” and “intelligencia”, in the manner of the Medieval Inquisition. Nothing was left un-slimed. 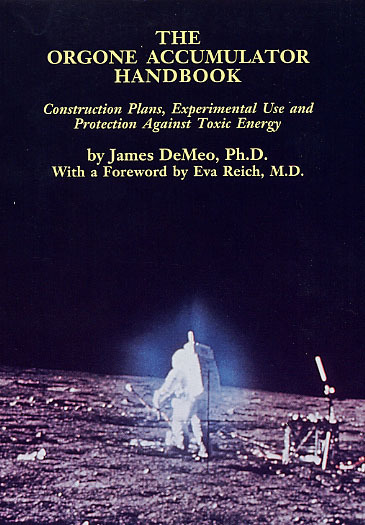 Reich’s personal biography, his work on sexual reform, his anti-Nazi and anti-Stalinist activities and writings, his scientific work on cancer, on microbiology, on the orgone accumulator and on desert-greening, all of it was subjected to the usual hyena-jackass ridicule via false claims and distortions, or simply erased from existence. Not one of those "professional journalist" reviewers raised questions about Turner’s accuracy or his smutty accusations against Reich. They appeared quite happy not to do so, or were getting paid not to do so. In any case, overall it was a protest too much, and history may record it as a turning-point, where "professional skepticism" will have exposed itself far too graphically, gone to such great lengths to publicly strangle an infant science in the cradle, for even those fully ignorant about Reich to feel comfortable with it, or remain silent about it. Some of that slime regrettably creeped into Nature magazine, stimulating the just-published article "In Defense of Wilhelm Reich", as noted above. 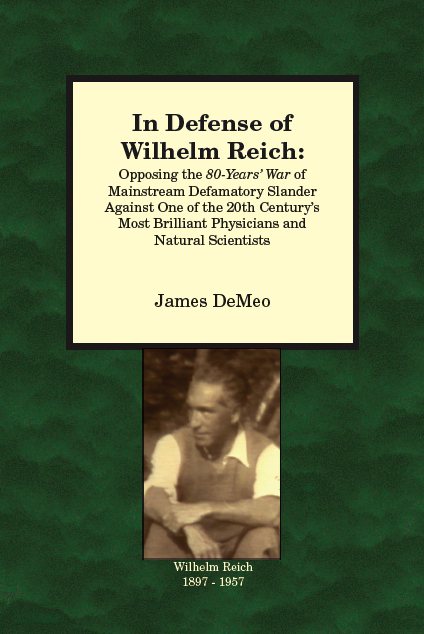 More details on these incredible events will soon appear in a new book by James DeMeo, PhD, now in press, entitled "In Defense of Wilhelm Reich: Opposing the 80-Years’ War of Mainstream Slander and Lies Against a Brilliant Natural Scientist and Physician". Not so chilly here in the mountains of Southern Oregon, but we do have a nice near-meter of accumulated snow-pack, which is unusual for so early in the Winter.